Have you heard of TED Talks? If not, I highly recommend checking them out. TED stands for technology, entertainment, and design. A non-profit started in 1984, TED Talks are one person on a stage sharing their work and passion in 18 minutes or less! TED Talks are full of ideas worth spreading. One of my favorite TED Talks was given by Dr. Amy Cuddy, a social psychologist at Harvard Business School, who studies stereotyping and discrimination, emotions, power, nonverbal behavior, and the effects of social stimuli on hormone levels. In this talk, Dr. Cuddy tells us that our body language speaks to others, but more importantly, it speaks to us. One of the “power” poses Dr. Cuddy recommends doing for two minutes – imagine that only 2 minutes! – to lower our stress hormone (cortisol) and raise our stress handling hormone (testosterone) has been nicknamed the “Wonder Woman” for obvious reasons, By standing or sitting tall, placing our hands on our hips, taking up space, looking out on the horizon, we begin to feel wonderFULL! Silly? Yes. Fun? Yes. 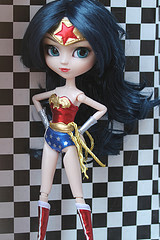 Would I recommend doing the Wonder Woman pose at least once a day? Absolutely! Try it out and let me know how you feel! I think we underestimate the power of our own body position to change our mood. We hear about how our body language speaks to other people, but don’t always consider how it speaks to our inner selves. I sometimes use different prayer postures that encourage you to consider different aspects of your relationship with God. I really enjoy the physical input to complement what’s going on in my mind. Thanks for the link to the TED talk. I love to watch a handful of them on Netflix when I have down time.